Alerting your housing that you will be moving out. Don’t forget to communicate with your regular academic advisor to register for your next semester here at the university! Similar to the cultural adjustment pattern when arriving in a foreign country, you may experience stages of cultural adjustment when returning home. Read over the Re-Entry and Cultural Adjustment to learn more! Global Opportunities at UA and Away! For many students, study abroad is only the beginning of a lifetime of engaged interest in all things international. Many return home and want to expand upon their international experience while at UA and even after they finish their degree. The following opportunities are great ways to build global competencies, help other UA students go abroad, learn a foreign language, gain international work experience, and get paid to study, live, work, and travel in a foreign country. All of which could be the kick start to your international career! Join the Education Abroad team in promoting our programming across campus. Gain professional experience in international education with a group of fellow study abroad alumni. Read over our Education Abroad – Internship Overview document to learn more! The University of Alabama’s Global Studies Certificate (GSC) is designed to introduce undergraduate students to the cultural, economics, physical, and political aspects of being a world citizen in the 21st century. Earning the GSC will improve a student’s global awareness while enhancing their resume. To earn the GSC students must successfully complete 15 hours of coursework specific to the GSC. Candidates for the certificate must complete an application form before the certificate can be listed on their transcript. Visit the Global Studies Certificate page to learn more! The U.S Student Fulbright Program is designed to give recent college graduates, graduate students, and young professionals the opportunity for personal growth in an international context. Most awards are for one academic year. Today the Fulbright U.S. Student Program is the largest U.S. exchange program offering students and recent graduates international opportunities to study, conduct research and teach. Each year, approximately 1,600 Americans study or conduct research in over 140 nations with the support of the Fulbright. This is a fully funded program through the U.S. State Department. For more information, visit the U.S. Fulbright Program page, email cic@ua.edu or stop by 135 BB Comer. The Peace Corps is a service opportunity for motivated change makers to immerse themselves in a community abroad, working side by side with local leaders to tackle the most pressing challenges of our generation. 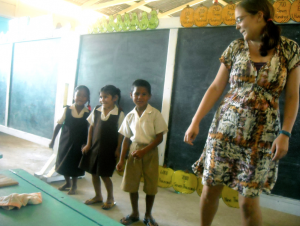 Peace Corps service is 27 months and can be completed in one of over 60 countries. With multiple sectors of service, finding a job to fit your interests and skills is easy! Visit the Peace Corps page to learn more about the program. UA has a Peace Corps recruiter on campus who can be reached at peacecorps@ua.edu with any questions before you apply, or throughout the application process. She is a Returned Peace Corps Volunteer who served in Swaziland!